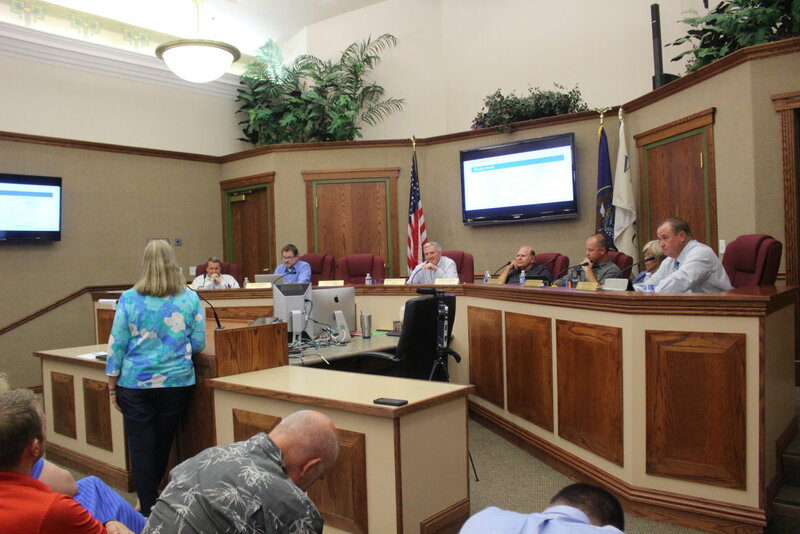 WASHINGTON CITY – For nearly three hours Tuesday, residents stood before the City Council and expressed concerns over a potential highway interchange they fear may exit into the middle of a residential downtown area. The potential interchange, which would be placed somewhere on Interstate 15 between the Green Springs/Exit 10 and Washington Parkway/Exit 13 interchanges, is one of the possible solutions proposed to deal with congestion issues surrounding Exit 10. Two spots that have been floated as possible locations for the interchange have been 300 East and Main Street – neither of which had any support from downtown residents Tuesday night. The council chambers were packed with residents to the point there was standing room only, with additional people watching from the hallway. 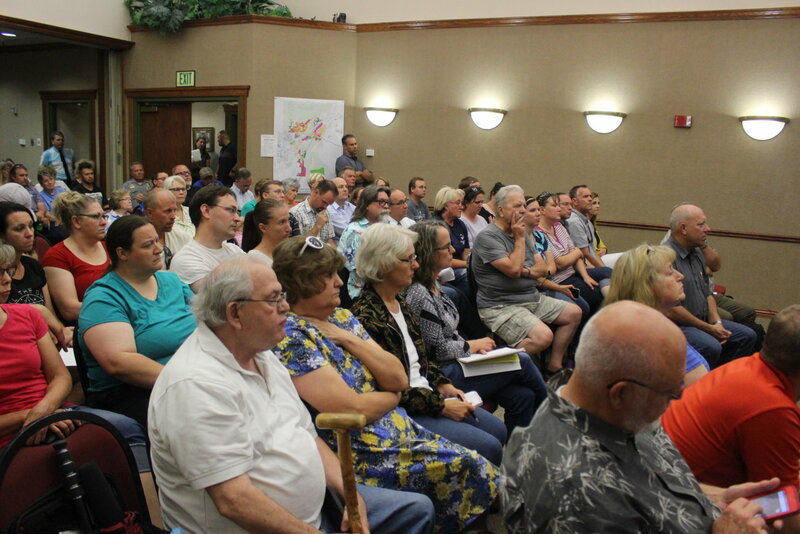 Common concerns expressed through the evening related to issues of public safety, particularly related to the elementary school on 300 East and worries over property value and possibly even losing homes to the interchange. It was also expressed that putting an interchange through the residential area would negatively impact the character of what has been called “the heart of Washington City,” if not outright destroy it. “It’s going to irrevocably change the character of the area,” resident Daniel Sanderson said. However, any new interchange or alternatives dealing with trying to fix the myriad issues with Exit 10 will be subject to the findings of an environmental assessment study that could take approximately 18 months to complete. “There’s no foregone conclusion there’s going to be an interchange there,” Councilman Troy Belliston said, adding that the City Council doesn’t have a goal to see an interchange carve up the downtown area. The study itself was described as “a decision-making tool.” Once completed it will identify possible solutions to improve traffic. An interchange in the downtown area is seen as only one possibility, provided that option survives the environmental assessment process. The study will look at various alternatives on how best to deal with Exit 10, Horrocks representatives said, as well as the impact those alternatives have on multiple levels to the surrounding area, including the potential economic, human and social impacts. Ultimately, a number of alternatives will be picked and made available to the public for review. A highway interchange may or may not be among the alternatives, Horrocks representatives said. The public will have a chance to provide input through a series of open houses and comment periods. They will also be able to offer comments and questions through email and a hotlink (435-477-6211). A website will also be launched outlining the progress of the environmental assessment study. A “Community Coordination Team” is also being formed that will consist of individuals representing not just the downtown area but also other facets of the community potentially affected by a new interchange or whatever the study proposes in the end. Team members are to provide input to the engineers while also sharing what they learn with those around them interested in the project, Mayor Ken Neilson said. Members of the community coordination team are chosen by the City Council. During the council meeting, Neilson encouraged those interested in being on the team to contact him. While council members said the environmental assessment needs to be done before any decisions can be made, some residents weren’t having it. “It seems like we should just toss out the environmental assessment,” said Doug Ward, a City Council candidate who stands opposed to the idea of an interchange. Every option to fix Exit 10 should have been exhausted before the council decided to commission an engineering firm to conduct the study, he said. Following the meeting, Ward said he saw the environmental assessment as a step toward the inevitable, adding that it felt like the downtown was under attack due to a narrow focus being put on the area between Greens Springs and Washington Parkway interchanges. 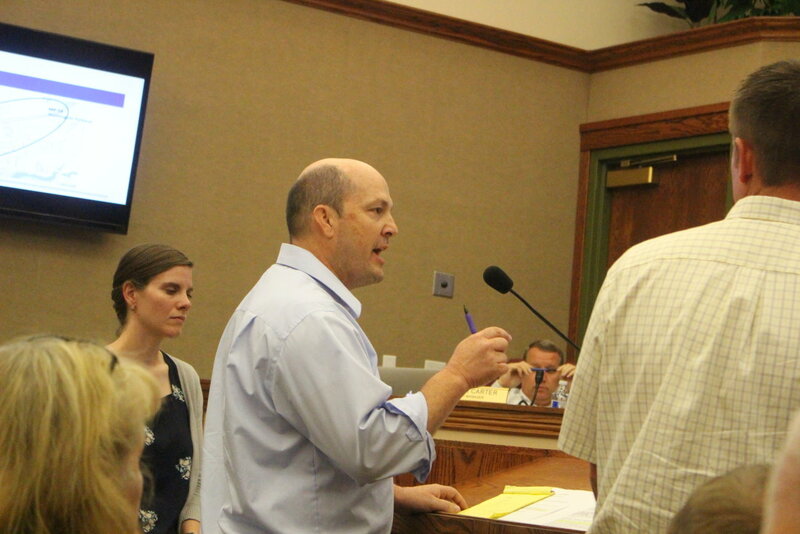 When one resident asked the council members their opinions of a highway exit into a residential neighborhood, Councilman Garth Nisson, who lives on Main Street, was the only one who said he was opposed to it. Belliston said he couldn’t make a decision until the options from the environmental assessment study were presented, saying that not taking that into consideration would be negligent. The first public open house and comment period concerning the project is slated for Aug. 29. Now I’m certainly no expert in much of anything. But I’d be willing to bet that the “simple” solution would be far more expensive, than just building a new exit. OTOH, exit 10 certainly is going to have to be dealt with sooner or later. Anytime you have this many different, busy streets coming together in such a small area, it is going to take tremendous planing, and new construction, to alleviate the mess. The new underpass across from the mall was going to “ease congestion” at Telegraph and Green Springs/3050 East. Hasn’t that just worked out great? I just hope the powers that be don’t decide that round-a-bouts are the heaven sent solution to this interchange/intersections mess. But I sure wouldn’t put bets on it. Remember how Washington Parkway was going to serve “a commercial area?” They lead us to believe that there was going to be a large commercial area such as a shopping center or big box stores or the like. What did we get? Ence neighborhoods. With what looks to be a very small commercial area. Maverik and a coming restaurant. Don’t know if anything else is planned there. I use the intersections around exit 10 way less now that there is an underpass by the mall. That has been great. But I can see how it has barely scratched the surface on exit 10. The northern corridor between Snow Canyon Parkway / SR-18 / Bluff / Red Hills Parkway and exit 13 would help a bit (as many cars go across Red Hills Parkway and get on the freeway to SLC or Hurricane from exit 10). Other than that there isn’t much you can do at exit 10. Even an exit between exit 10 and exit 13 will only help to an extent. There actually is a lot that could be done with exit 10. But it would take a major amount of money, and negatively impact every business in the area. The entire area would have to be redesigned with the idea of future growth in mind. Major changes would have to be done to every roadway in the area. This whole problem is because of the ever-expanding development of green springs. How about running a road from the back end of North green springs drive to exit 13, this would solve everything. But the developers want the money from developing that same property where they could run a road to line their pockets. A majority contributor to the congestion of exit 10 is because of the development of green springs, How about using the property between green springs and exit 13 to make the road? How about quit letting the developers screw over the less affluent. Or is this just the norm for southern Utah? That’s a great idea, it’s called the Norther Corridor. It would already be in the final planning phases if the greenies and the DC bureaucrats could stay out of the way. The review process needs to define what existing traffic would likely utilize a new interchange, instead of continuing to cause congestion at Exit 10. My guess is that you would still have the huge volume associated with businesses in the vicinity of Telegraph / Green Springs, stretching as far north as Wal-Mart, and down to the RC Mall. The existing commercial development generates much of this traffic, and is unlikely to taper off. A new interchange at Main Street, for example, might serve the new Brio development, and the existing townhomes around Millcreek and further south on Buena Vista, past the fire station. It is hard to imagine much traffic exiting I-15 at Main Street, then making their way down Main Street to Telegraph, then on to Wal Mart / Home Depot / Etc. As pointed out above, Exit 10 is likely to need further investment to improve flow of the significant traffic burden, even after a new interchange to the north is built. and wherever there is a any kind of trail or access, there is a sign posted private keep out, including pedestrians and bicycles. If you try and ride a bicycle on green springs drive, there is no bicycle lane or trails, this is a self serving community that uses the property and facilities for a very small number of people. Any other part of the Saint George area including Bloomington, Santa Clara, Ledges, Snow Canyon, there are designated bike lanes and trails, It sure seems like the Washington City planners have been doing special favors for the developers of Green Springs. I thought Green Springs was owned by the city, how can they put up signs posting it private property?? How about widening Green Springs drive so they can install a bike riding lane so all taxpayers of Washington city and county can utilized this beautiful part of out community instead of a very few? Honestly, the area around 300 E is a disgrace. The trash and rundown properties east along Telegraph are a blight. Residents of Coral Cayon have to drive past that junk daily to get to grocery stores, banks and the post office. If the new interchange won’t revitalize this area, then a separate referendum should. I drove in Manhattan for over 30 years and Exit 10/Green Springs SCARES ME! I avoid it as often as possible. Why not a south bound only exit before Exit 10 exiting toward Buena Vista on the west side of 15?